California State Parks is responsible for the care and management of approximately 3,000 historic buildings and structures. After decades of deferred maintenance and inadequate funding, many of these structures are in poor condition. When funding is available, State Parks preserves, restores, rehabilitates, or occasionally reconstructs historic structures, in accordance with the Secretary of the Interior's Standards. Any treatment of an historic building needs to begin with a condition assessment. This webpage is intended to assist state parks staff, and others interested in preserving historic structures, with conducting condition assessments. Building condition assessments are as the first step in restoring or preserving historic structures. On this page, we have collected some resources to help in the planning and execution of building condition assessments. The Training Video on building condition assessment is a good place to start. 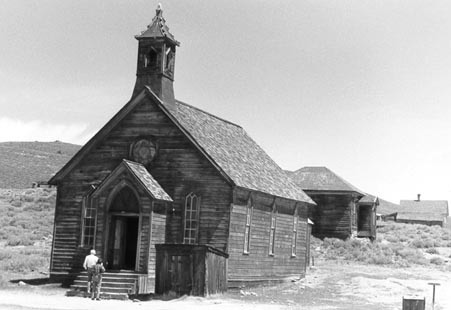 Although it was filmed in Bodie State Historic Park as part of a workshop on "Arrested Decay," the information and approach can be applied to building condition assessments for any historic building. seven miles south of Bridgeport, California.